Up until a week ago, we were told the science was settled: salt is bad, the less you consume, the better. 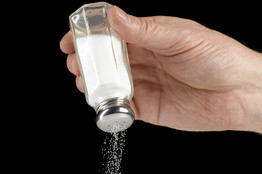 Anyone sprinkling salt on their food must be deniers of the 100% consensus of scientists and thousands of peer-reviewed papers over the past 40 years proving beyond any reasonable doubt whatsoever that table salt is sodium pollution to the human body. "several related papers in this week's New England Journal of Medicine undermine these [sodium] recommendations, and one even speculates that the official targets pose health hazards. In one of the most complete treatments of the subject to date, researchers followed more than 100,000 people world-wide for three and a half years. They found that those who consumed fewer than 3,000 mgs had a 27% higher risk of death or a serious medical event like a heart attack." It's yet another example of confirmation bias, "consensus" groupthink, and the dangers of assuming scientific debates are ever "settled." Likewise, until very recently, the 100% scientific consensus was that saturated fat causes obesity & heart disease and to eat low-fat carbs instead. Now disproven, the settled overwhelming 100% scientific consensus thrown out the window, low-fat carbs are bad, saturated [and unsaturated] fat good in moderation. Likewise for the 100% scientific consensus for over 50 years that peptic ulcers were due to stress or eating spicy foods, later proven to be completely false and instead caused by infection by the bacterium Helicobacter pylori, and treatable with antibiotics not histamine blockers. There are hundreds of other examples in the medical and physical sciences where the overwhelming > 97% scientific consensus was flat out wrong. The bogus "97% consensus" on climate change will be next on this long list of "consensus" failures. We were told the science was settled. Yet new research suggests that salt is not nearly as dangerous as the government medical establishment has been proclaiming for many decades—and a low-salt diet may itself be risky. Other than how to season tonight's dinner, perhaps there's a lesson here about politics and the scientific method. The USDA, Food and Drug Administration and other regulators have long instructed eaters to consume no more sodium than 2,300 milligrams a day, or about a teaspoon, well below the U.S. average of 3,400 mgs. The limits are said to reduce the risks of high blood pressure, cardiovascular disease and stroke. But several related papers in this week's New England Journal of Medicine undermine these recommendations, and one even speculates that the official targets pose health hazards. In one of the most complete treatments of the subject to date, researchers followed more than 100,000 people world-wide for three and a half years. They found that those who consumed fewer than 3,000 mgs had a 27% higher risk of death or a serious medical event like a heart attack. The findings are associations, not definitive clinical proof (to the extent there is such a thing). But they add to a growing literature arguing that the evidence that sodium is harmful is weak or nonexistent, including a report last year out of the Institute of Medicine. If the war on salt was wrongly declared, that may be because diet is inevitably an elusive and ambiguous field given the complexity of human biology. What we know about the body evolves over time. Many theories of food and health are no more than superstition, so any nutrition advice that is more specific than moderation and more vegetables ought to be taken with a grain of—well, you know. Yet the latest USDA food pyramid, which was updated as recently as 2011, clings to simplistic low-salt pseudo-science. The FDA is pressuring food manufacturers and restaurants to remove salt from their recipes and menus, while the public health lobby is still urging the agency to go further and regulate NaCl as if it were a poison. The larger point is that no scientific enterprise is static, and political claims that some line of inquiry is over and "settled" are usually good indications that real debate and uncertainty are aboil. In medicine in particular, the illusion that science can provide some objective answer that applies to everyone—how much salt to eat, how and how often to screen for cancer, even whom to treat with cholesterol-lowering drugs, and so on—is a special danger. Government regulation often can lock in bad advice and practices and never changes as quickly as the evidence evolves. So be glad the salt debate continues. In an article in the Guardian, Richard Tol wrote that “There are plenty of examples in history where everyone agreed and everyone was wrong”. He didn’t give examples there – perhaps he thought this was so well known that it wasn’t worth commenting on, or perhaps space was too limited. Here are a few examples of where the consensus has turned out to be wrong (thanks to @Fastcom, @intrepidwanders, @DerrickByford, @nmrqip and @Beautyon for suggesting many of these). More examples welcome! Yes, I know, these stories are all greatly oversimplified. Copernicus, Galileo and the Sun. For some time after Copernicus wrote his book saying that the Earth goes round the Sun, most scientists continued to believe the opposite. Ernst Chladni and meteorites. The consensus was that meteorites came from the earth, perhaps from volcanoes, until, around 1800, some nutter suggested they might come from outer space. Cholera and John Snow. The consensus was that cholera was caused by ‘miasma’ – bad air, until John Snow identified a link with a contaminated water pump in the 1850s. Semmelweis, hand-washing and puerperal fever. His results were rejected because they conflicted with the consensus of scientific opinion. Evolution. The consensus was that God created species in a few days. Darwin was so worried about the consequences of what he’d found that he sat on it for many years. The Aether and the speed of light. It used to be thought that light travelled at a certain speed relative to a background known as ‘aether’. Experiments and then Einstein’s theory of relativity showed that this was wrong. Wegener and continental drift. Wegener was attacked and ridiculed for this theory. George Zweig and quarks. The consensus was that protons and neutrons were fundamental elementary particles until Zweig and Gell-Man came up with quarks. Barry Marshall and stomach ulcers. The consensus was that gastritis and ulcers were related to poor diet and stress. in 1984, Marshall had to ingest the bacteria, helicobacter pylori, to show he was right that this was the cause, and eventually won the Nobel Prize. Stanley Prusiner and prions The consensus was that disease agents needed nucleic acids. Prusiner’s theory of prions in the 1980s led to incredulity, personal attacks and then a Nobel Prize. Barbara McClintlock and “jumping genes”. Another Nobel Prize winner whose work wasn’t accepted at first because it went against received wisdom. It is one thing living and working indoors in a temperate climate, another issue entirely if you work outside in the tropics. I can't find the link, but I recall a problem when the outside workforce at Mount Isa City Council was persuaded to go low-sodium diet. Half of them off sick with muscle damage and strain injuries.